Bourgas Airport Transfers – you can now book your airport collection online from Bourgas Airport to Sunny Beach, Nessebar, Aheloy, Ravda, Pomorie, Sozopol, Elenite, Primorsko, Obzor, Varna, Golden Sands, Albena and another main tourist destinations. We provide Bourgas Taxis/Private Car & Mini Bus Transfers. Burgas Airport Transfers/Taxi – fast, secure and efficient door-to-door taxi service, competitive rates, entertaining, experienced and English speaking drivers, new air-conditioned vehicles, free baby seats, without hidden and additional charge, all your transportation needs in Bulgaria. Booking your airport transfer before you arrive is highly recommended.All airport transfers will be confirmed to you by email. When you come through customs, our driver will be holding an “DND” sign. If your flight is delayed, we will still be waiting and we don’t charge extra. The southern Black Sea coast runs south from Cape Emine to the village of Resovo on the Turkish border. The sunny beaches in this area are numerous. Little resort towns alternate with large luxury complexes, there are reserves, landmarks of natural beauty and camping sites. Here are the famous Bulgarian Sunny Beach Resort and the city of Burgas. There can be found a multitude of hotels and restaurants, as well as the architectural reserves of Nessebar, Pomorie and Sozopol. 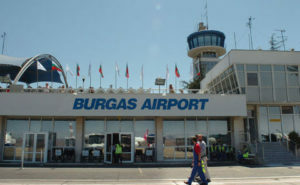 Burgas is a modern city, one of the largest in Bulgaria. In summer many people choose this city as a place to spend their beach holiday. Burgas offers great vacation opportunities by combining beautiful beaches and reserves with the comforts and benefits of a big city. The bustle of the many bars and restaurants livens the streets, while the spacious sea garden is an excellent place to go for a quiet walk. The sea garden also provides a platform for artists and musicians to showcase their work. The city hosts many cultural events – music festivals, competitions, flower exhibitions. Burgas is a city with more than 2,000 years of history which can be explored through its numerous museums and churches. Sunny Beach (Slanchev Bryag) is the largest Bulgarian resort. It is located 30 km northeast of Bourgas, between Nessebar and St. Vlas. There are hundreds of hotels of all categories, including small family hotels, apartment-hotels and big luxury complexes. The resort is a favourite destination for young adults because of its popular clubs and parties. During the summer months world-famous celebrities and DJs are often invited to give performances. In addition to its many modern clubs and discos, Sunny Beach offers other attractions – aqua parks, water sports, and many other sports and entertainment facilities. There are many shops, restaurants and even big shopping centres. Nessebar is another popular Bulgarian resorts. The coastal town has modern hotels, a beautiful sandy beach and a rich historical and cultural heritage. It is several kilometres south of Sunny Beach. It boasts a wide range of hotels, guest houses, luxury complexes, along with restaurants and taverns. The proximity of the town to Sunny Beach Resort is an advantage for guests looking for fun and variety. . .Nessebar is undoubtedly one of the most romantic resorts in Bulgaria. The charm of the Old Town and the glimpse of the past it offers will help visitors experience new emotions and fill them with unforgettable memories. The town of Pomorie is probably one of the oldest in Bulgaria. It is located on a small rocky peninsular halfway between Burgas and Sunny Beach. Pomorie’s beaches attract many visitors with their interesting black sand and clear seas. Nearby lie the protected areas Blatno Kokiche and Koriyata, and lake Pomorie, where salt is extracted. Other places of interest are St. George Monastery, Preobrazhenie Gospodne /Transfiguration of Jesus/ Church, a Thracian domed tomb and an architectural reserve for old Pomorie houses. Moreover, Pomorie is one of the most popular spa and balneologic resorts in Bulgaria because of its healing mud and mineral springs. Sozopol is one of the most popular Black Sea resorts. Small restaurants perch on the coastal cliffs of its Old Town and offer a magnificent view of three islands. In its narrow streets tourists can buy authentic Bulgarian goods – knitwear, leather goods, and even have their portraits done by a local artist. There are two beaches in the town and nearby there are several camping sites, Ropotamo Reserve and other places of interest. There are also hotels or guest houses. Restaurant by the beach, merry tavern, discos or clubs make for an unforgettable holiday. There are many more resorts and complexes along the southern Black Sea coast. Primorsko, Kiten and Lozenets are favourites with the young people seeking fun and excitement. Ahtopol and Tsarevo attract families with children because of their tranquillity, while Sinemorets and Rezovo are preferred by those who want to have a closer contact with nature. This stretch of the Bulgarian Black Sea coast provides numerous camping sites which offer good facilities and added value. Among the most popular ones are camping sites Gradina, Zlatna Ribka, Kavatsi and Smokinya near Sozopol, Coral, Oasis and Arapya next to Primorsko and Silistar between villages Resovo and Sinemorets.